Lahti, Finland – The problem with confidence is that you can’t train for it. It’s not something that’s handed to you. There’s no textbook to provide you with a roadmap. If you want to gain confidence, you need the courage to reach out and simply grab it yourself. In Sunday’s classic technique team sprint at the Nordic World Ski Championships in Lahti, Finland, the buzz was around Norway, Sweden, Germany, Finland and Russia for the women. USA wasn’t in the mix. Except in the minds of Jessie Diggins and Sadie Bjornsen. Two days earlier, Diggins had won silver in the women’s freestyle sprint, going toe-to-toe with the best in the world to win a third career World Championships medal – an individual medal. But in a team event, not only do you need confidence in yourself, but teammates need unqualified trust in each other. Diggins knew the grit it takes to succeed on a head-to-head battleground. And she had unwavering confidence in her partner. The wild card was that it was classic technique (diagonal striding versus skating) – not historically a U.S. strength and an event in which the U.S. had never medaled at World Championships. Bjornsen grew up in Washington state’s Methow Valley. And she loves classic skiing. Six years ago she moved to Alaska to join the prestigious APU Nordic program with coach Erik Flora. Injuries throttled her at first, but she persevered – slowly but surely establishing herself on the World Cup tour – gaining confidence. She knew this event was made for her. But she carried the frustration of feeling overlooked when sprint teams were chosen in the past. It was a brilliant marriage, matching the proven medal-winning skills of Diggins with the passion inside Bjornsen to step up onto the world stage. Bjornsen would open each leg with Diggins anchoring. From the opening gun in the finals, Bjornsen was in command. She charged up the first hill elbow to elbow with the biggest names in the sport to take the lead – showing all those around her that the USA was there to play. Bjornsen handed off to Diggins for the first of her three legs with the lead. A seasoned veteran, Diggins played a cagey game, maintaining tip to tail contact but laying back to watch and observe, conserving energy. On the second lap the intensity grew. Bjornsen kept the Americans in the hunt while Diggins mentally plotted her final lap game plan. Diggins tagged off to Bjornsen for her final lap. She was tired. She was banged up from a crash after the last exchange. But she knew the job she had to do. She took the inside lane trying to get her own track up the stadium hill but was pushing snow as she fought to stay near the front. Bjornsen closed the gap, sweeping off the Lahti Corner and into the stadium fully in contact with the bronze medal group. Now, it was go time. 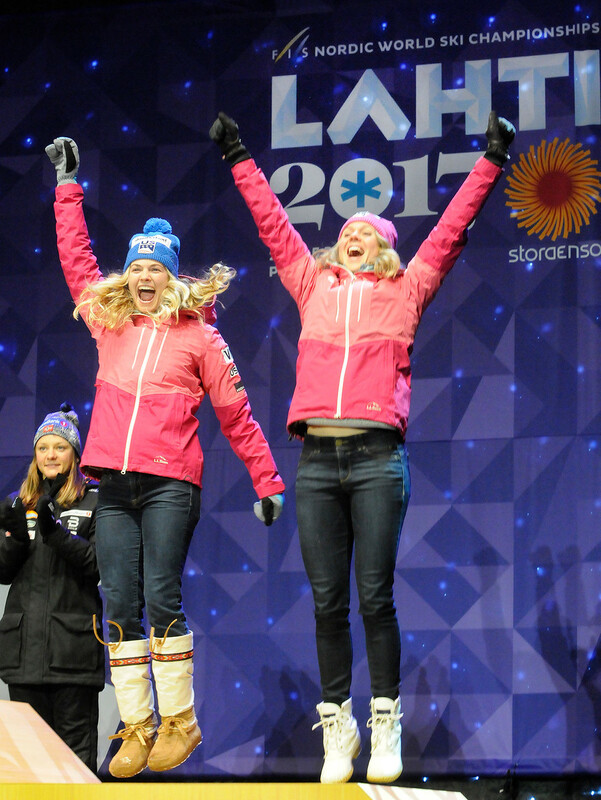 Bjornsen handed off to Diggins in fifth, with four nations in the bronze medal hunt behind Russia and Norway – Finland, Germany, Sweden and America. Diggins exploded out of the stadium, powering up the stadium hill, pivoting around the 180-degree turn then charging up Indian Hill. The bronze medal matchup was now Jessie Diggins versus Sweden’s Stina Nilsson, who already has five World Cup wins this season. Diggins let Nilsson lead. Coming off Indian Hill they swept down towards the Lahti Corner, Diggins’ fast Salomon skis sticking right on Nilsson’s tails. Around the Lahti Corner and down the last hill, she set herself up for the move. As Norway’s Marit Bjoergen crossed the line for gold over Russia, the real race began. Coming around the final 180 in the finish, Diggins made her calculated move, passing Nilsson on the inside to take the bronze medal lead. In the finish, Bjornsen was screaming. There they were – two of the great stars of the sport battling it out toe-to-toe. They were side by side in separate tracks, each of them double poling until their shoulders burned. As if in slow motion, Diggins earned her stripes as a classic skier. Lungs burning, body aching, she never flinched. With the line just meters away, Diggins stretched every inch of her tiny frame in longest finish lunge ever to win bronze. Bjornsen grabbed her in a hug before Diggins collapsed to the snow in complete exhaustion, panting furiously from the battle before rising. “It just slowly dawned on me,” said Diggins. “We just won a medal in a classic race. We’ve been working towards it for a long time—targeting this race for a long time and thinking about it and planning and visualizing it.